Hello everyone!! It is strange to be writing you on a Wednesday. We traded our Monday preparation day for today because we had plans to drive up to the temple. Unfortunately, it decided to snow about 6 inches last night, and the roads were pretty hazardous for driving. We talked it over with our ride and decided we’d better postpone. Such a bummer! But it’s better to be safe than sorry. I feel like it has been forever since I’ve written, and so much has happened! I’ll try to narrow it down to the more important stuff. Last Monday I was adventurous and let a missionary cut my hair for me! No worries though, she’s a licensed hair dresser and worked in a salon for like 2 years before the mission. She just evened it all up for me, and I really like it! On Tuesday, we had Zone Conference down in Worland, WY (~1hr away). It was awesome! They focused it all about the Book of Mormon. They split us up into reading groups and assigned us sections of the BoM to read, and between the 60 or so missionaries there, we read the entire Book of Mormon in like 2 hours! Our mission president told us that our mission is the most successful of the 18 missions in our region, but that’s no reason to slack. He challenged us to step up our game, and have more unshaken faith! Unshaken faith has kind of turned into our motto for Meeteetse this week. 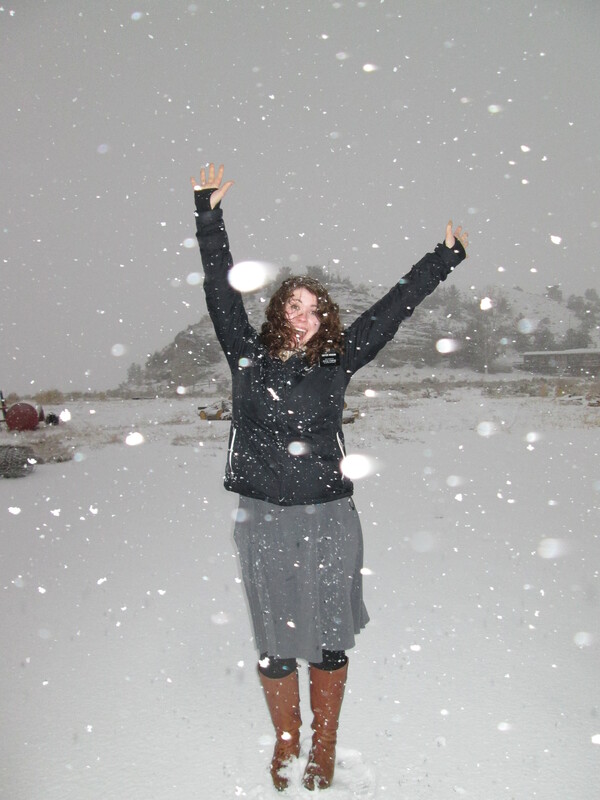 After zone conference, I had a new experience- I went on exchanges in Lovell, WY! First time I’ve ever had to leave Meeteetse… soooo weird. I missed it so much! I am dreading the eventual transfer of leaving Meeteetse. Hopefully that won’t be for a while though! Being in Lovell was good. One lesson we taught really stuck out in my mind. We met with a young man named Sam. Turns out, he’s from Oklahoma City! The sisters in Lovell said that they always struggled with teaching him, but once he realized that I was a normal person from where he was from, the lesson went so much better. I really feel like I was meant to meet him and teach him, even if it was just that once. At the end of the lesson, I felt prompted to tell him this, “If you forget everything about me, my name, that I’m a Sooner fan, etc, then that’s totally fine. I just want to you remember that I know this gospel is true and the Book of Mormon is true and powerful, and it has changed me”. The Spirit was so strong, and I just pray that he felt the same witness that I felt. I got back home to Meeteetse Thursday morning, and it was so nice to have things back to normal! We had an awesome dinner appointment with some members and our investigators. They are both so prepared!! We didn’t have time to teach the Restoration, so we just shared a short message. I felt prompted to invite them to come to church (they have come once before like a month ago), and this was their response: “yeah! We were wondering why our friend (the member) never invited us again”. Lol! It’s amazing to see how many people in our lives are just waiting for the invitation to act. We have the gospel, and we have the responsibility to offer it to those around us. They ended up having a conflict on Sunday so they couldn’t come, but hopefully they will come next week after General Conference. 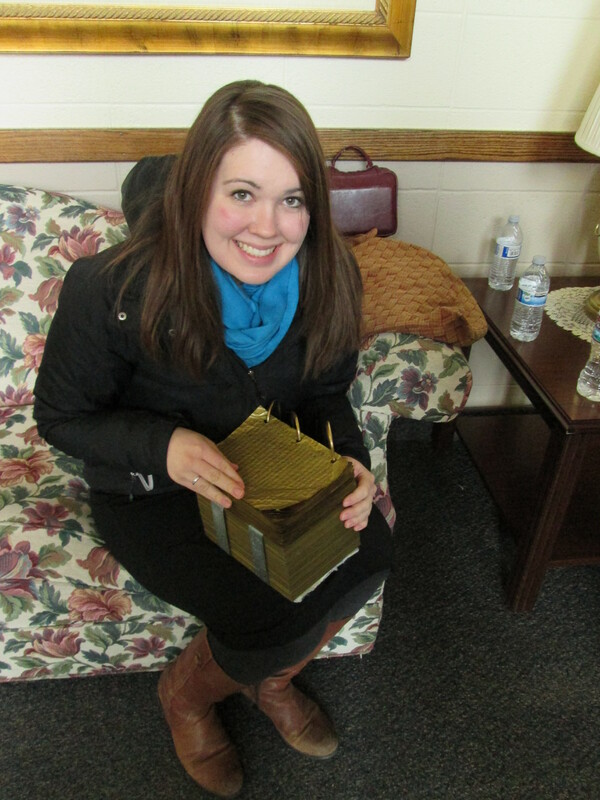 Some gold plates replicas at zone conference; those things were superrrr heavy. We taught a ton of lessons on Friday, and we found out from our Zone leaders the we had tied for the most lessons taught in the Zone for the previous week! The Lord has some awesome things in store for Meeteetse. I’m just grateful that I get to be a part of it. On Friday, we taught another investigator about unshaken faith and related to her the story of Christ and Peter walking on the water. When Peter first stepped out, he showed extraordinary faith. But, as he notices the “winds boisterous”, he took his eyes off Christ and began to sink. He allowed his faith to be shaken! Each of us have boisterous winds in our lives that scare us and make us doubt. But, like Peter, all we need to do is ask for divine assistance from our Savior. When we shared this with her, Sister V felt prompted to invite her to church again. She has turned us down I don’t know how many times in the past. But when we invited he this time, she confessed that she was afraid of going to a new church, but that if we would go with her, she would love to come. We were like, “yeah we’ll go with you! !” We had a member pick us and her up for church on Sunday, and it was a great experience. We also had some members pick up our other investigator for church, so that was awesome too! Saturday night we carpooled with a member up to Cody to watch the Women’s Broadcast, and it was amazing!! I hope you all watched it and loved it as much as I did. Everyone, including me, just sat there and cried during it. It was awesome. On Monday we had a really good proselyting day. We were able to do some stuff that we wouldn’t have been able to any other day of the week, so that was a blessing! We went for dinner to a family’s ranch, and our truck got soooo muddy driving out there, hahaha. All their cows are having their babies right now, so after dinner we went out with them to check to see if any had been born. We did find one heifer that was about to give birth in like less than a half an hour! They take turns on going out every night to check on the cows during this season. Even the kids are super involved! The sister told us how some of the baby cows were about frozen, so she and her 12 yr old daughter spent all night warming them up by rubbing them and putting a blow dryer on them. Life on a ranch isn’t just a job, it really is a lifestyle. I’m not sure I would want to do it, but who knows! One last story! So last night we had dinner with one of my favorite ladies. For dessert, she made creme brulee and we had a little blow torch to caramelize the sugar on top. Well, it ran out of propane, so she refilled it, but it kinda spilled a little bit. We didn’t think anything of it until we lit the flame. WHOOSH! The entire table erupted in a two second flame! Oh boy did Sister V and I bolt! hahaha. It wasn’t a hot flame or anything, and it was gone in seconds, but still, it scared all of us about half to death! We had a pretty good laugh about it afterwards though. Nothin’ wrong with a few singed eyebrows once in a while! Well, I think I’ll wrap it up for today! I love you all so much! It is such a blessing to have such wonderful family and friends who support me as a missionary. Have an awesome week!! !